Although most of my posts are about prisons, prison museums, exhibitions and other carceral sites that I’ve visited personally, I’m also interested in prison tours more generally and the ways in which these are choreographed by prison authorities. The Groupe d’Information sur les prisons (GIP) take off the media prison visit in one of their ‘Intolérable’ pamphlet dedicated to France’s ‘model’ prison Fleury-Mérogis built at the end of the 1960s. Such visits and tours demonstrate the complicity of mainstream media with prison and government authorities and their respective agendas towards prisons whether this be the promotion of an effective penal system or the call for widespread reforms due to poor conditions. As Michel Foucault suggested in Discipline and Punish, the failure of the prison system is inherent to its very existence as mode of punishment par excellence. 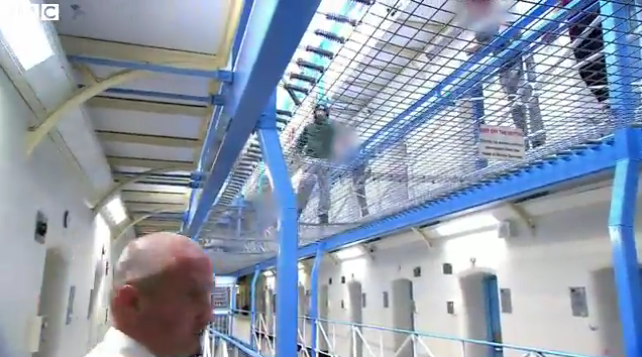 Last night’s News at Ten on the BBC included a special report on HMP Wandsworth where the BBC had gained exclusive access for a week of filming. (See the report here: http://www.bbc.co.uk/news/uk-36321266). The report was shown on the same day that the Queen, in her annual parliamentary address, announced government plans for the widest prison reform since the Victorian era. If the BBC report is anything to go by, such reforms will have little to do with improving the conditions of those doing time both during and after their sentences. Rather, the choice of images taken from a week’s worth of footage together with editing techniques resembled those found in popular U.S. prison documentaries especially those looking at prison gangs. Here, the emphasis is on depicting the prison population as caged animals often complicit in their own framing as such. Most of the footage shown in the report involved the camera crew crammed alongside officers on the narrow walkways outside upper level cells. It was also from this position that an inmate was filmed climbing on protective mesh like a monkey at a zoo. A young female guard was interviewed just metres away from a group of inmates openly smoking weed in response to which she asked the camera crew what exactly she was to do about it the implication being that allowing drugs inside prison made life easier for everyone. Inmates and guards faces were often blanked out yet such individuals often remained easily identifiable via clothing, tattoos and facial hair. There was standard footage of inmate’s feet as they walked through the prison alongside those belonging to the reporter, Ed Thomas. Aerial shots of the prison yard claimed to show rival gangs fighting over drugs with little substantiation of this. Although the report was just over 5 minutes long, it also employed the same repetition technique found in hour-long U.S. documentaries which allows for excessive commercial breaks and ensures a single, basic message is hammered home to viewers. In the short BBC report which had no real need for this, we saw the same clip of a prison guard stating he was the most stressed he’d been in 24 years on the job 3 times. Interestingly, the prison governor Ian Bickers was filmed away from the backdrop of the prison, giving his interview as a talking head in a darkened studio setting. This, it seems, was intended to establish a distance between the governor and his staff, whom the BBC depicted as both corrupt, incompetent and under enormous mental pressure. Away from such scenes of overcrowding and violent confrontation, the governor was, conversely, able to appear calm and collected, a worthy recipient of the newfound autonomy the government is about to bestow upon him when Wandsworth becomes one of six prisons to ‘pilot’ a decentralized prison service. What this actually means is autonomy over the prison’s budget. While this was framed by the report as allowing those with better insight into the prison and its inmates to put government money to better use in the management and rehabilitation of offenders via drug rehabilitation and work programmes (the report also featured an interview with Michael Gove calling for day release programmes which put offenders ‘to work’), all notions of prison as rehabilitation were completely undermined by the depiction of inmates as dangerous, out-of-control animals unable, as one inmate interviewed suggested, to exit the ‘cycle of violence’ they found themselves in. It was telling that the same inmate who had earlier been restrained by 8 officers was now willing to be filmed (anonymously) articulately affirming his status as violent offender. Juxtaposing such images and statements (the written report on the filming published on the BBC website describes the prison population of Wandsworth as follows: ‘Dangerous men are held inside, some are murderers and rapists, others include pickpockets, drug dealers and fraudsters.’) which contain no nuance or sensitivity towards different individuals being held within Wandsworth, against calls for work programmes and the use of ankle bracelets quite deliberately assures public resistance towards such programmes in favour of more oppressive warehousing techniques found within the U.S. prison industrial complex. Michael Gove’s claim that the public should not fear the release of such inmates to participate in work programmes is an act of bad faith intended to produce public animosity towards such schemes whilst maintaining the pretence that inmate labour should be redirected away from criminal networks towards acceptable forms of production and consumption. Yet, such productivity will no doubt come in the form of the possibilities opened up to private sector contractors providing services to UK prisons. The BBC also seems to be paving the way for the development of UK prisons’ cultural capital (again following the U.S.) in the form of documentaries which demand a different form of ‘labour’ as inmates perform their criminality on cue to the cameras now given increased access to the carceral space. The irony of such dehumanising sensationalism at a time when the BBC is threatened by cuts and privatisation should not be lost here. On a final note, the report by the BBC came just a month after the Channel Four news report on ‘Dads behind bars’. The 13-minute report looked at the ‘Fathers Inside’ scheme introduced at HMP Parc to ensure fathers in prison had greater involvement with their children whilst serving time through homework clubs and sessions on parenting and responsibility. Channel Four’s more positive approach to issues of fatherhood and rehabilitation in its presentation of the work currently being done by UK prisons to ensure contact between inmates and their families might be held up in contrast to the BBC’s sensationalist yet clichéd depiction of Wandsworth and its inmates. The longer report in which many of the inmates interviewed are clearly identified along with their children and partners is clearly aimed at humanising those featured. At the same time, it is clear that the programme is only reserved for a select few within the UK’s largest prison. While inmates involved in the scheme were serving sentences for a variety of offences, the report focused primarily on Jonathan Gilbert, serving a 12-year sentence for fraud. A charismatic, amiable figure, easily identifiable as a father, Gilbert was able to clearly articulate his shame for his crime of mortgage fraud and his subsequent failure as a father. As such the report plays into class prejudices which see television audiences sympathise with those committing white collar crimes whilst allowing the BBC’s depiction of Wandsworth’s inmates as ‘dangerous men’ to co-exist alongside it without pushing more difficult questions around incarceration.